To begin, a recap of seasons 1 – 4. 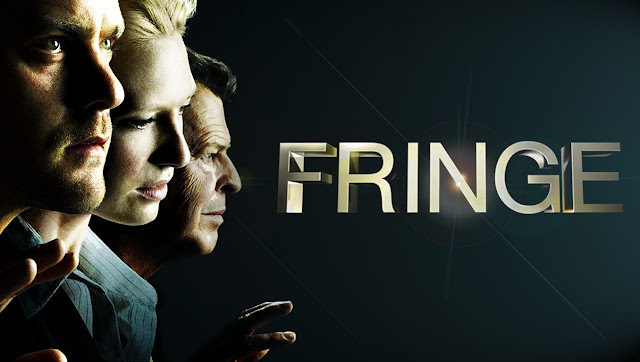 For me, Fringe had a very specific structure that revealed itself as the seasons progressed. Basically this was: Season 1 – The Pattern. Season 2 – The War. Season 3 – Alternate Universe. Season 4 – Utopia. Season 5 –Epilogue or The Observers. As far as I can see, Fringe really payed off in season 4, so anyone waiting for a final payoff that is where to find it. I see season 5 as the Epilogue really, a story after the pay off that involved the same characters but in a dystopian future that was not part of the ‘hope’ that typified the series up until that point. That’s okay, and more questions were answered (though not all), it just felt like a different show. Season 2 sees the show explore the alleged war brewing between ours and the alternate universe and the terrorist group called ‘ZTF’ who are exacerbating Fringe Events (in many cases causing them) in order to create weapons for the perceived oncoming war. It is revealed between season 1 and 2 that Olivia was one of the cortexiphan children and in fact, one of the most promising, which is what has made her a prime target for ZTF to study and use. As events develop, the magnitude of Olivia’s abilities is revealed as well as her feelings for Peter. Peter is the key to unlocking her potential. The end of the season presents an encounter with the Alternate Universe and ultimately results in the capture of our Olivia and her replacement (Fauxlivia of the Alternate Universe) in our world. Okay? Okay. Now it gets confusing. During season 3 we discover more about the Alternate Universe and about the characters that we have grown to love. We see our Olivia in the other universe, brainwashed and struggling to get free, and we see our beloved characters in the Prime Universe (ours) manipulated by Fauxlivia. The plan seems to be to accumulate parts for a machine that is being built. The objective? Destroy our universe. It becomes clear that Walternate (Walter in the Alternate Universe) believes that the only way for the Alternate Universe to survive is to annihilate our universe, and that the Alternate Universe has suffered long and lasting affects of our world’s Walter stealing Peter. Huge sections of the cities are preserved in amber, the Fringe Division are out in the open and is the enforcing agency protecting the world from the frequent and devastating Fringe Events. When both Olivia’s are returned to their respective universes, a number of things happen. For a start, both sides become interested in being the first to use the machine to destroy the other. For second, Olivia’s relationship with Peter becomes strained as she realises that he continued their relationship with Fauxlivia. And finally, Fauxlivia is pregnant with Peter’s child. This is important. Remember this. In a convoluted plotline, Peter, to whom the machine is biologically linked, enters the machine. Olivia is used as a ‘crowbar’, the reasoning being that Peter will only be able to choose which universe is destroyed depending on which of the Olivia’s he chooses. Upon entering the machine, Peter’s consciousness is transported to the future, a future in which he chose to destroy the Alternate Universe and this caused the inevitable but slow destruction of our own. Walter is the builder of the device, using the opportunity to show Peter what will happen if he destroys one of the universes. Peter returns to the present, and creates a bridge between the two worlds, explaining that destroying either of them would only result in the destruction of the other and that with the bridge in place, the Alternate Universe could start healing. He says all this, and then promptly disappears. Yes. Disappears. And the teams from both universes act as if he has never existed. The Observers explain that he has served his purpose, and as a result of the multiple paradoxes that both Peter himself and the events of the machine created, he was deleted altogether. Finding it hard to keep up? Season 4 begins with a re-introduction of the team, including our world’s version of Fauxlivia’s best friend Lincoln Lee. Without Peter, a vast number of things have changed, not the least of which are the Fringe team. Olivia is less emotive, Walter under house arrest living in the lab and less developed, Astrid is working in the field, and Lincoln joins the Fringe Team as Olivia’s partner. There are echoes of Peter that are still bleeding through. Walter is seeing him appear in reflections. Olivia is dreaming about him. When Peter eventually materialises (an Observer known as September allows this to occur), he believes (as do the rest of the characters) that he is from another universe altogether and tries to enlist the help of both Walter’s to understand the machine and whether it can send him to his own universe. As the season progresses Lincoln’s feelings for Olivia bud, while Olivia’s feelings for Peter begin to develop again. Once she fully remembers who he was and what he means, and the Lincoln of the Alternate Universe dies, the Lincoln of the Prime Universe chooses to cross over to the other side and stay with Fauxlivia when the bridge has to be closed. The bridge has to be closed to thwart what has apparently been the ultimate thread and plan underpinning Fringe as a show. The Mastermind? William Bell. See William Bell was really smart, but perhaps not as smart as Water Bishop. He was equally arrogant though and together they developed the notion that people destroyed everything and that if one could be God in his own world, surely that would be better. Bell devised a plan and manipulated events between the universes to destroy them, the theory being that the two colliding universes would create a new universe and that Bell could play God and populate this universe with his own creations, developed through the Fringe Events of the past. In closing the bridge and later, by shooting Olivia, Water undoes Bell’s plan and allows both universes and billions of people to survive. This in many ways is the ultimate payoff. The culmination of a number of threads and stories. That the ultimate goal was to create Utopia (William Bell’s world) and that the Fringe Events, though caused by Walter saving Peter, were used as a vehicle to develop technologies across universes to destroy them and facilitate creation of Utopia. Enter season 5. The Epilogue. The story that fits but doesn’t quite fit. Isn’t quite about Fringe science. Isn’t really Olivia’s story. Is more of a dystopian future that the same characters have found themselves faced with. A tribute to George Orwell’s 1984. The premise is clear (ha! Nothing is simple or clear in this show). Throughout the series there are beings knows as The Observers. These Observers are advanced human beings, created through technological advances. They exist out of space and time, having developed the technology to travel through time and space and observe with out displaying emotion and therefore, without interfering. A group of Observers are seen throughout the series observing important moments in time, and of the Fringe Team. One of these Observers is called September. Often, this character interferes, having disrupted the timeline by distracting Walter at a crucial moment in his timeline and needing to set the timeline right. For the most part it is unclear what their role is, other than observing and in September’s case, putting events back on track. The main problem revealed in season 4 was the creation of a child that should never have existed in Peter’s child with Fauxlivia, this also had to be corrected and resulted in Peter’s ultimate deletion from the timeline. However, September, now attached to Peter, does not completely delete him from the timeline. This results in the fruition of another plot. It is revealed in season 5 that the Observers we saw in the series were part of a team of 12 scientists who were sent to watch humanity through a certain era. What those Observers did not know was that their superiors intended to use the information gathered to invade the timeline in 2015. The invasion would ultimately see the destruction of humanity, and with it, emotion. Season 5 reshapes the team’s circumstances as part of this dystopian future. The information we have is that they were working on a plan after invasion day, and that they had to encase themselves in amber to preserve themselves and the plan. They are released by the Resistance in 2036, which includes Peter and Olivia’s daughter, Henrietta, whom they thought they had lost in the invasion. The series takes the team on a journey to find a number of pieces of a plan to defeat the Observers, as Walter doesn’t remember what the plan was. During one of the missions to retrieve parts of the plan, Etta (Henrietta) is killed by the head of the Observers on earth. This causes Peter to spiral, implanting Observer technology in his brain, though this is thankfully removed at a later date. The Peter-as-Observer plot seems pointless at first glance. It doesn’t contribute to the plan, it doest advance the story, or Peter’s characterisation in many ways. However, upon further reflection it seems to have been used to allow the viewer to identify that Peter losing who he was and his emotional integrity makes him less human, less able and frankly, less of what a viewer would consider a ‘good person’. Seeing a character who is emotionally and intellectually gifted turn into an emotionless and scruple less robot allows the viewer to understand what humanity will lose if the Observers evolve the way that they have. This therefore allows them to justify what is in a way a type of genocide, although they are not annihilating the Observers but changing their evolutionary path. It’s complicated. All of the characters make an emotional journey through the season. Peter’s desire for revenge for Etta causes him to nearly lose everything that he loves and holds dear (Olivia, Walter, Earth) and lose hope. Olivia’s spends a lot of time grieving the loss of being a mother and feeling that she has no control over her world anymore. Walter, having had pieces of his brain replaced, is faced with the possibility of becoming a terrible man again. A man who thought William Bell’s plans of Utopia were a good idea. There’s some juicy stuff in there, but what it lacks is the Fringe feel of the previous seasons. Olivia is not the point of view character. In many ways, Peter is. The view is an underlying hope, but against seemingly impossible odds. The oppressors are bigger than Ben Hur. The espionage becomes a much more important factor in the episode to episode functions and development of the plot. This is all great storytelling, but certainly not Fringe in its purest form and certainly what I would call an epilogue. We discover that September has been punished for interfering; he has had his tech replaced and is living as a normal man. A man that is helping the resistance and Walter create and deliver the plan to defeat the Observers. So what is the plan? The plan, it turns out, is to send to the future, a genetic anomaly of the creation of Observers in a boy who exhibits emotions and intellect at degrees the Observers never thought possible. If they send him at the exact time that human scientists made the discovery that emotions were impeding intellectual growth, then they could study the boy and see otherwise and would perhaps never invade. To me, this was a little far fetched and optimistic. Would these people find this boy and discover all of the things that we hoped they would and therefore, choose to take a different path. The boy cannot speak after all and this might not stop an invasion. They did an impressive job allowing the Observers to study the boy in this timeline and see their reactions. The piece that was added that made this more believable was heart breaking… Walter was going with him. Turning to episode 5.13 itself; there are many commendable things to discuss in the exit of a long running, convoluted and character driven show, the best of which was that they made it about the characters. This episode was at the face of it, about saving the world (no biggie) and was about resetting a time line. The logistics, the risk of that, the plan they would have to pull off, the stakes, that’s all great story telling, good plot development and payoff. But for me this show at its heart was about the characters. About the people. And so was this episode. There are 5 key character moments that stand out for me. My only complaint (although it may be a loud one) was that none of these was an Olivia moment, and she had been the leading lady and central character of the show for 4 years. Maybe they felt that her emotional journey was over, I don’t know, but certainly this was a massive gap. This scene made me cry. There I said it! If my brother wasn’t in the room I would have been sobbing and I am sure he would have been too. This father son relationship has been so beautiful and so strong for so long that to see it coming to an end made the viewers feel the way the characters felt. This was the moment that Peter discovered his father was leaving and their time together was over. Joshua Jackson and John Noble were astounding as Walter explains to Peter that all the time they had together was stolen, and that he wouldn’t trade it for the world. That he now wants to give Peter the opportunity to have Etta back and to have his own family, to be a father. And as they both hug, crying, Walter says to Peter “you are my favourite thing in the world Peter. My very favourite thing”. I’m getting tingles writing it now. It was heart breaking. Having taken care of Walter and become like a daughter to him, Astrid brings Walter into the amber to show him Gene, their beloved cow, and explains she wanted him to see Gene for the last time. He tells her that she has always known how to soothe him. Tearfully, she tells him that they’re going to win, and that this isn’t the end. He tearfully doesn’t tell her that he’s not staying with them; even as she tells him that they are going to be having strawberry milkshakes together. As she is walking away, he says “It really is a lovely name… Astrid”. He has spent the whole 5 seasons calling her every other name, pretending he doesn’t remember her name, so for her and for Fringe viewers, that’s the real goodbye. And yes, there were tears in my eyes again. Both actors clearly care for each other and the show so much and their performances back that up. September explains to Walter that he wants to take Michael instead, knowing that Walter once viewed this has his redemption, but now, identifying that he needs to do this because of the way he feels about Michael. Walter says “That’s what it is to be a father”. September of course, dies, in the final battle which is one of those snap deaths that you don’t really have time to process but that hit you hard later on. Beautifully done and addressing both of the characters needs for redemption. In the moment of September’s death, it becomes apparent to everyone that this means Walter is going. Having not said goodbye to Olivia (grr) Walter steps up, takes Michael’s hand and heads for the open wormhole. As he turns back and looks at the team, and his son, Peter mouths “I love you dad” (also significant because of the fact that Peter always referred to him as Walter) and then Walter disappears into the abyss. The white tulip, throughout the course of Fringe’s development has become this amazing symbol of forgiveness and redemption. In season 2, terrified of telling Peter where he is from and the events surrounding his life, Walter looks for a sign from ‘God’ to tell him he will be redeemed and he will be forgiven… a white tulip. Walter helps a man in season 2 find his redemption and peace, and the man, having altered the timeline, sends Walter a drawing of a white tulip at the precise time that Walter needs to feel forgiveness. This is what sets Walter on the path to redemption. Walter explains in episode 5.13 that taking Michael to the future and saving the world, finally ending all the destruction that he felt responsible for was his redemption and that he would be deleted from the timeline on Invasion Day if the future is reset. At the end of the final episode, the timeline having been restored, Peter returns home with Etta and Olivia to find a letter from Walter (whom has presumably now been deleted from the timeline), inside the envelope is the drawing of the white tulip. This finale, though well constructed and a lovely bittersweet end to the series relies on some big assumptions and suspensions of disbelief. As discussed before, how can we trust that the Observers would not invade later? How can we know that every problem is finally solved? Many episodes along the way seem to indicate that things are coming to a close, many questions are answered, but perhaps cleverly and in true Fringe spirit, the final episode doesn’t end the story. The worlds created and the characters we love still exist somewhere, and most of them are still alive and on new journey’s. We want to know how Walter was successful. We assume the Observers still exist to some degree but with this emotional intellect. We want to know if Etta grows up to be the same woman. We want to see Olivia and Peter finally live their lives out happily. And in some ways we can, there are comic books, there are fan stories, there are our own assumptions and the ways we deal with the end of a shows journey and its characters in our head. Fringe doesn’t force us to ponder any ‘real world’ question. It doesn’t break the construct of the show to apply to the modern time or our world as many shows do in their close. Fringe simply ends. And it ends with Peter receiving a symbol of love, hope, redemption and forgiveness, and then looking at the screen. The look lasts a second, a second of understanding, of possibility that he knows what happened, what that tulip means, and that there might be another adventure in store. All up, a fantastic and consistent series with a satisfying end, perhaps because JJ Abrams finally made a show where he answered questions along the way, planned arcs well and developed a handful of great characters rather than doing the opposite. The final episode didn’t answer a million questions because they were no longer there to be answered. It took the time to reflect on the life of the show and the lives of the characters and leave them in a place where there are possibilities. Which is what Fringe was ultimately about. A world of possibility. I think this would have been a very cool ending. I think the following notion popped into my head around the time Michael walked off the monorail and was taken into custody and it really took off when he gestured to Olivia with his finger to his lips (shhh - it will be OK). I really thought I had pegged what was going to happen at the end. I thought I had seen some foreshadowing with the Recordist’s son creating his own comics about the original Fringe team. William Bell had attempted to create his own universe. Walter and Donald created the universe where they hid Michael. With all of the whimsical mystery enveloping Michael, I began to expect to have the final scene “draw back” after Walter and Michael walked into the wormhole (or after Peter opened the mail) and show September interrupting Michael while he was “playing with HIS Fringe Universe”, which of course would have ultimately been what we all had been watching all along. The REAL story of the Observers, full circle. Michael’s Fringe Universe. And to perhaps validate the foreshadowing of the comic strip and even September’s punitive transformation, Michael and his race, instead of pale and bald, actually exhibit skin traits similar to, but not exactly like the disease afflicting the Record Keeper refugees. Would that have blown some minds or what? That's blowing MY mind. So yeah, I think that would have blown some minds. What you are saying makes a lot of sense, and much aside from that it is just very very cool. I always felt like Michael had more significance and felt a little robbed of that story in the end. Sure, it made sense that he was the thing that could stop the Observers evolving the way that they did, but really? Really? Was that all there was to it? Michael seemed like he had so much more person hood, there was so much more going on. Surely this could have been his universe and play thing. How has he functioned as part of it would also have to be explained. Whether or not your ending would have been accepted is another story. Should the Observers be these God-like beings? I would say that if we are looking at pre-season 5 Observers then yes, absolutely. But by the time we know everything we know about them in season 5, including how they operate and that they are basically nothing without the tech in their heads, it becomes easier to see weakness and to see them as fallible. Would making them God-like actually work after that? I'm not sure. Convince me. I also wonder where they might have gone if this was a longer season or if they had of had more time. I think the show really could have ended at the end of season 4, but let's suggest that it continued and the Observers are depicted the way that they are in season 5, surely there is more to that. Surely what they had planned wasn't so black and white. Maybe with a longer season Michael could have been all that he could have been. But really, I feel like the creators also wanted something that was on the realm of possibility. Could they expect us to believe that we will evolve to the point where we can toy with nature like 'Gods'. I think they parred it back and did a slightly easier sell on the idea that these Observers are evolved and fallible human beings. It makes sense that we would progress to a point where we felt emotions were unnecessary. I kinda like the idea as well that there is not such thing as a 'God' perse in this show, that God-like ability and capability is what we don't understand and can be gain. Man, what a show. I love these types of conversations! To the root of my premise and how the Observers had evolved within the story really does not matter. What I am getting at is that the Observers, including Michael, in the story ARE advanced humans. But showing Fringe as a "play universe" casts the "real" Michael into a God-like species, human or not. That would leave each viewer hangin' (I think in a good way) to decide for themselves about who or what the real Michael was. I do think that this type of ending would have been far more risky with regard to overall fan response. I think the majority of fans really liked the ending. As did I. But as you said, I like thinking a little different and I did get quite excited when I thought I had predicted the ending. I love thinking about how all life on our planet could or will evolve and even more so, about how life on ther worlds could or would look. I love shows like the Science Channel's "Through the Wormhole" and others that look imaginatively at how life elsewhere might have begun and evolved. Carl Sagan had a HUGE influence on me with the his "Cosmos" book/show. He talked about how unimaginable the technological gap would be between ANY two interstellar species that might meet for the first time. I love many (if not all) science fiction movies about Earth visitations but I have not seen any that did not have undeniable and blatant flaws in many details of how we would interact. With a hostile encounter there is nothing to discuss or imagine. We would not even realize what happened or even that it happened. Friendly contact may be something like comparing Humans/Bees - Aliens/Humans. Only our imagination puts on the limits. I cannot get enough of this stuff. Back to the point, I am glad that Fringe got the chance to end in style. Most TV is just plain garbage. And unfortunately, it is a true reflection of our society. Aha! I get it. An evolved species that could use the 'Fringe Universe' as a play thing merely because they are more evolved, not necessarily Gods. I like it. I think it could have been sold, but like you said, I also really like the ending that we got. That Fringe managed to keep the story based in evolution was a fantastic benefit in of itself. I think it was important to explore the ideas associated with how we might behave as we evolve, what would be important and how it would change how we define humanity. It also gave the show a chance to explore what is really important about humanity; companionship, emotion etc. and the fact that it doesn't necessarily limit us the way that we might think it can. Thinking about this stuff is why I love science fiction and fantasy. I think they are important conversations to have. I too am interested in the shows that look at how a visitation of an alien race on Earth might go down. Recently, the V remake actually grabbed me. I am sad that didn't keep going because it was a really interesting concept, that an advanced race might come in peace, knowing what we would want, and slowly enact their plan to conquer us. I also loved District 9, which showed the alien species as advanced in some ways but less advanced in others. How we treated those aliens was a sociological reflection on society and how we treat others. For me, this is a real gift of science fiction, using it not only to understand alien encounters, but through those fictional encounters, ourselves. Yes, I agree that it was great that Fringe got the chance to end with integrity. Too many good shows are rushed in the end or prolonged so that they lose what was good about them, and as you say, too much trash is already on television. I long for these kinds of shows and I lament when they are no longer a continuous part of my life. But I think we continue to enjoy them through conversations like this. Yes! District 9 was very good. Right after making my last post I watched a recorded Through the Wormhole episode titled "Is the Universe Alive?". I could not believe the karma! It was pretty intense. This is an overview copied from the website. I could not find a link to the episode so now I am sorry I deleted it after viewing. Could our universe's collection of stars, galaxies, and black holes follow the same rules of existence as biological life? The cosmos itself may be a superorganism, a collection of separate bodies that act like a single being — just like ants in a colony. One scientist believes cities are superorganisms and perhaps our universe is a super-scaled up version of these metropolises. One bold thinker hypothesizes that our universe may have emerged from a set of laws similar to biological evolution. Like we pass DNA from parent to child, the cosmos may also produce offspring that inherit its genetic make up. And the seeds of these cosmic births could exist inside black holes, the endpoints in the death of massive stars. If the universe is a replicating, living being, one visionary thinks he's found its pulse. Energetic particles called neutrinos may propel our universe to expand and contract every trillion years — like a slow beating heart — as it moves from one life cycle to another. And if it has a heart, it must have a brain. Our universe could function like a giant quantum computer, processing and storing information on everything we see around us. And we might be able to find its program. But could space and time be merely a physical illusion created by our own minds? One renegade researcher contends the universe is alive in our imaginations. Without us, it ceases to exist. If this intrigues you imagine seeing the episode. I hope you get the chance. This is the kinda stuff that really stirs me. There is no one in my life who has even a small understanding about this stuff, let alone a passionate understanding. Thanks for letting me share. I found a link. Enjoy. Wow. Thank you for sharing. I will let you know when I get a chance to watch. Here is another tremendous science fictiion episode that blew me out of the water when I first watched it. The intensity is enhanced if you know of, or better yet, are a fan of Star Trek TNG. I suggest adding this to your viewing list as well.